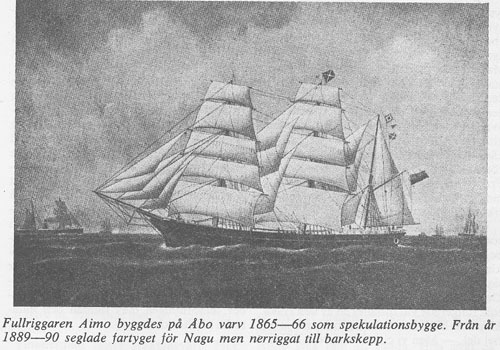 The full-rigged sailing ship "Aimo" was built at Åbo shipyard in 1865-66. In 1882 she was rerigged in Sharpness into a bark. In a snow storm in the middle of December 1898 the Finnish sailing ship "Aimo" failed in a tacking maneuver and sailed straight into the archipelago outside Nämdö and stranded on the skerries "Vitkobbarna". With the two ship's boats, the whole crew got safely to the nearby island of Rågskär. Eighteen soaking wet men doing a surprise visit in the early evening at the crofter's cottage! The ship could not be saved. It was sold and the wood was used for building houses. Later the left-overs of the ship was used as an artillery target by the Swedish navy. A four inch "slice" of the 8 by 11 inches thick stock. At Långholmen, an island close to Runmarö (North of Nämdö), tradition says that part of a pier and part of a barn came from the Aimo ship. This "slice" has been ground to allow for a dendrochronological analysis. Several radii have been measured (Aimo.rwl) and a mean value of that was analysed. Skärgårdsmuseets tidskrift Skärgård nr 19 Nov 1979, artikeln "Aimo" av Allan Gustafsson. Om förlisningen, se Maj-Britt Eriksson, Notvarp i Nämdö 1979 eller ovanstående nummer av tidskriften. With the presumed Aimo sample provisionally dated to 1792 the matching of each member to that year ("Test towards (dated!) reference") could be analysed. With then only the best eigth members selected, I got: ... with corr >= 0.30 and with overlap >= 107 Results sorted according to decreasing correlation coefficient values. I.e. the best T-value is 6.2 towards the reference from Estonia at year 1792. That is a quite certain dating of the outermost ring of the stock. The "Aimo" was built in Åbo and launched in 1866. If this stock is a part from "Aimo" - which we have good reasons to presume - some 70 rings of sapwood have been cut away as the outermost ring of this "slice" grew in 1792.